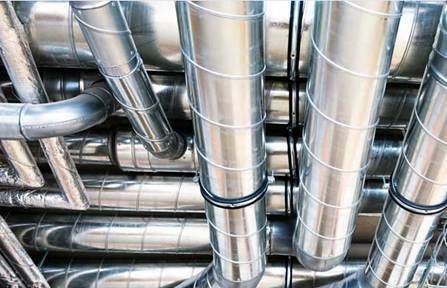 Ducted or non ducted air systemsFor the past 50+ years, engineers have been “designing” duct systems. Quite often, they were not actually designing the duct system, but were sizing duct the duct according to some rules of thumbs. The rules of thumbs varied by different engineering firms and often ducts were sized to be round by a predetermined friction rate that was chosen by the engineering firm. Then if the round duct did not fit and sometimes when it does, it’s often converted to rectangular, making it a lot less efficient system. Often, the whole ductwork system is “sized” that way using a Ductulator. Not much thought is given to the fittings used and often leakage of the system is not considered during the design phase. So how do we go about designing duct system to be green? There are many aspects to design, but focusing on the duct system design we want a system that minimizes the use of energy, time and material and make sure it meets the acoustical requirement of the application. To accomplish these goals we have to consider what the duct system will be used for (standard air conditioning, exhaust, or other), duct system layout, fitting selection, system leakage, acoustical properties and equipment selection. There are three common methods of duct sizing or design for commercial and industrial duct systems: equal friction, static regain and constant velocity. Both the supply side (positive pressure) of the fan or air-handling unit (AHU) and the return side and makeup air side (negative pressure) of the fan have to be considered. The equal friction method and constant velocity systems can be used for either the supply or return side. Most often equal friction is used on the supply and the return systems while constant velocity is used for exhaust systems that have to convey particulate or fumes. Static regain however is strictly used for a positive pressure design. This article will focus on the design of the duct system on the positive side of the fan or Air Handling Unit (AHU). Other important aspects that that should be looked at during the design phase may include fan or AHU selection, system effects, leakage, diversity, room air distribution, equipment layout and commissioning. Those are topics for other papers. Whether a system is designed with Equal Friction or with Static Regain, there is still likely to be imbalance. There should be less with the Static Regain design, but because in the real world we don’t have an infinite number of duct sizes, there is always some imbalance. Using the Static Regain design though helps to minimize this imbalance. Ideally we want all paths to be critical paths. That would mean the system is perfectly balanced. With imbalance means some paths will have more pressure (excess) available than they need, which means they likely have sections that can be made even smaller. Note to designers less efficient fittings will generate more noise, but that is generally not a problems till you get close to the final runouts. It’s best to design with high quality fittings that have lower pressure drop, then use smaller sizes. Using multiple runs of round rather than rectangular or flat oval duct could save even more money on the job. The process of taking a given design, determining the excess pressures available in the non-design legs, and making them smaller to use up the excess pressure, is often referred to as a total pressure design. It can be applied to any design method, but is most suited to be applied to the Static Regain Design method since it should already be fairly balanced. The good news is some of the duct design programs pinpoint the critical legs making it easy to identify where there will be excess pressure. In an article published by the Air Conditioning, Heating and Refrigeration News in their June 18 1990 edition, a system was designed with the Equal Friction sizing method with three different friction rates (0.05 in wg/100 ft., 0.10 in wg/100 ft. and 0.50 in wg/100 ft.). Then each of these three systems was designed with Static Regain, then the Total Pressure design. The system design airflow is 26,800 cfm and the designs were such that the Static Regain and Total Pressure methods had about the same operating pressure as the respective Equal Friction designs. The first section was the same size in all design methods. The results of the three designs are given in the Table 2: The system had a 12-inch height restriction. For the 0.05 in wg/100 ft Equal Friction design, the percent of sections that became round went from 32% to 61% by using the Static Regain design method and 71% for the Total Pressure design. Similar results can be seen for the two higher pressure designs as well. Round ductwork cost much less than rectangular or flat oval, saves installation time, is easier to seal and the Static Regain and Total Pressure design methods are much more balanced! The other advantage of total pressure design is that since it is a balanced system using smaller sections of duct which have higher attenuation and insertion losses. So using that knowledge, and keeping the velocities reasonable, total pressure designs should not require as much noise control. A high performance duct design should minimizing leakage. ASHRAE recommends the system leakage be no more than 5 percent of the total airflow volume. Why is that so important? If a system leaks and airflow requirements are not met in the locations they were intended, the leaks either have to be sealed or the fan speed must be increased to generate more volume. If the leaks are not sealed, a practice which is no longer allowed by many codes, that additional volume will need to be pushed through with a higher static, because remember that the system will continue to leak and that the airflow volume, plus the additional leakage airflow volume caused by higher static pressures will need to be overcome as well. Essentially you are changing the system curve from what was designed to what is actually happening. The design point for a fan is where the system curve crosses the fan curve as shown in Figure 1. It assumes no leakage is occurring. If there is 10% system leakage, the duct system is essentially relieved and the system curve moves down. That is because the same volume of air does not have to move through the entire system as some has leaked out. The airflow increases while the Fan TP decreases as shown in Figure 2. We can’t just speed up the fan as shown in Figure 3 so it produces the same original Fan TP as leakage is still occurring. We will actually have to move to a higher RPM and increase both the Fan TP and the airflow so we get the correct airflow to the outlets as shown in Figure 4. ASHRAE studies have shown the cost of leakage could be $0.00050 per cfm-hr. So a 50,000 cfm system operating 2600 hrs per year with 10% leakage of 5000 cfm, could cost an additional $6500 per year. You will likely need a computer to do the proper designs, but if you do; less time, material, and energy will be expended. With the proper controls and other components, the Static Regain/Total Pressure duct system designs are used in true High Performance Air Systems. What more could you ask for in a duct design.